Organizers of New York City’s proposed AIDS Memorial Park today announced the winners of their design competition. 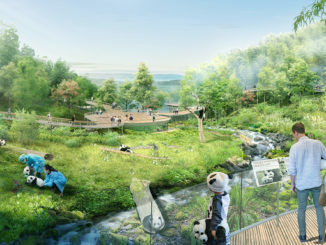 First place was awarded to Brooklyn, NY’s studio a+i: Mateo Paiva, Lily Lim, John Thurtle, Insook Kim, and Esteban Erlich, with a rendering by Guillaume Paturel, for their design “Infinite Forest.” The design was selected from 475 entries submitted between November 29, 2011 and January 21, 2012, representing more than 26 U.S. states and 32 countries on six continents. 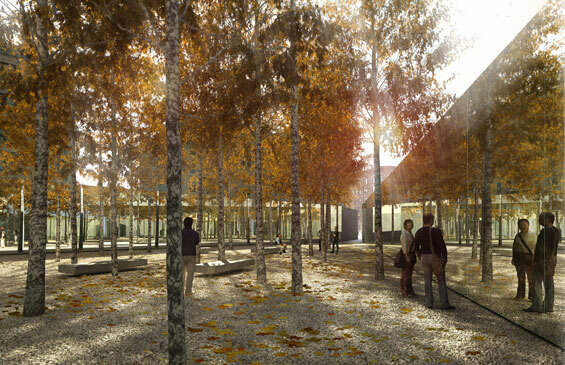 “The proposed AIDS Memorial Park commemorates the past while embracing the present and the future,” said Jury Chair Michael Arad, Partner, Handel Architects and Designer of The National September 11 Memorial. “The winning design creates a space for reflection, awareness and recognition, while acknowledging the history of the disease. The St. Vincent’s site is significant because it is intimately tied to the history of the AIDS epidemic, especially the early history of the crisis. It was important that the jury’s selection should ultimately deliver a public space that serves as both a neighborhood park and an AIDS memorial of significance,” Arad said. 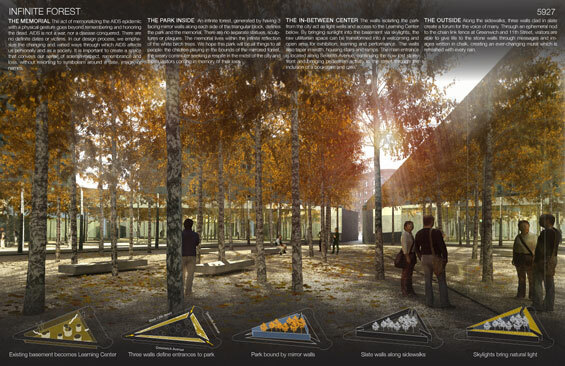 Christopher Tepper and Paul Kelterborn, co-founders of the AIDS Memorial Park Coalition, envisioned the design competition as inspiration for an AIDS Memorial Park that seamlessly integrates park and memorial features. “The winning concept inspires us, and is the starting point for an iterative process to design a green oasis with an AIDS memorial for the community and New York City. We look forward to working with all parties to make this dream a reality,” said Tepper and Kelterborn in a statement. Arad presided over the design competition’s diverse jury, whose members include Kurt Andersen, Novelist & Journalist; Barry Bergdoll, Professor of Architectural History at Columbia University and Chief Curator of Architecture & Design at the Museum of Modern Art in New York City; Kenneth Cole, Fashion Designer and Chairman, amfAR, The Foundation for AIDS Research; Elizabeth Diller, Professor of Architecture at Princeton University and Founding Partner, Diller Scofidio + Renfro; Whoopi Goldberg, Actress & Comedian; Thelma Golden, Director & Chief Curator of The Studio Museum in Harlem; Robert Hammond, Co-Founder & Executive Director, Friends of the High Line; Regan Hofmann, Editor-in-Chief, POZ Magazine and poz.com; Brad Hoylman, Chair of Manhattan Community Board #2; Amy Sadao, Executive Director, Visual AIDS; Ken Smith, Landscape Architect & Principal, WORKSHOP: Ken Smith Landscape Architect; and Suzanne Stephens, Deputy Editor, Architectural Record. The proposed location of AIDS Memorial Park is an approximately 17,000 square-foot triangle-shaped plot of land bordered by Seventh Avenue, 12th Street and Greenwich Avenue in New York City’s West Village. The property stands across the street from the former St. Vincent’s Hospital, known as the epicenter of New York City’s AIDS epidemic. Following St. Vincent’s bankruptcy in April 2010, Rudin Management Company acquired the entire medical campus, with plans to turn the property into luxury residences including new public open space at the triangle site. The redevelopment received unanimous approval by the New York City’s Planning Commission at a meeting on January 23, with strong support from Chair of the New York City Planning Commission & Director of the Department of City Planning Amanda Burden and others for an AIDS memorial within the park. The AIDS memorial has received broad-based support from AIDS advocacy groups across the city, historic preservation groups, and local community and political leaders including Community Board #2 Chair Hoylman. New York City’s City Council will vote on the redevelopment for the site in late February or early March.